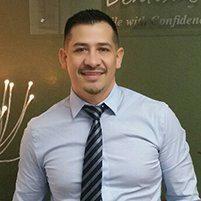 Dr. Zamora installs a variety of dental created to repair damaged, loose or missing teeth. Patients can visit his practice in the Mission District of San Francisco, CA to address their specific needs. Dental implants are installations directly into a patient’s jaw which are used to secure bridges, replace a missing tooth, or anchor dentures and overdentures. This procedure is the only tooth replacement procedure which stimulates the jawbone and supports soft tissue growth, making the mouth stronger and healthier. An implant is typically a titanium post, which is implanted into the patient’s jaw to act as an artificial root for a new prosthetic tooth. Titanium is used most often because of its unique biocompatibility. The visible tooth is usually a crown which is manufactured to look like a natural tooth and blend in with its neighboring teeth. Dental implants are usually installed over three visits to the dentist. First, the dentist installs the titanium post into the patient’s jawbone. The next appointment will be scheduled after a couple of weeks, to allow the titanium to fuse with the jawbone and create a stable foundation. As the post fuses with the jaw it stimulates bone growth, reducing chance of bone loss which is typically associated with the loss of a tooth. At the second appointment, the dentist installs the abutment. The abutment connects the titanium post to the new prosthetic tooth. A temporary crown will be fitted at this point to hold the space while the permanent crown, bridge or denture is made specifically for the patient. Once the prosthetic tooth is ready, the patient will return for the last visit, and the new tooth will be installed, then buffed and polished to match its neighbors. Dental implants are manufactured to last for just as long or longer than natural teeth. While implants will not decay, regular care is still necessary. The surrounding natural tissue can still deteriorate and cause problems if neglected, resulting in further dental issues and need for treatment.